The Massachusetts Supreme Judicial Court’s recent Kain decision placed the Baker Administration on notice: The Commonwealth must establish regulations that will ensure the annual emission reductions needed to keep its 2020 greenhouse gas emissions below 70.8 million metric tons of CO2-equivalent. With only 52 months left to achieve this Global Warming Solutions Act target, Massachusetts will need quick action from its Office of Energy and Environmental Affairs, along with strong collaboration from legislators, environmental advocates, utilities, and local governments. With the House and Senate having now resolved their differences on the 2016 energy bill, what are Massachusetts’ prospects for complying with its climate law? Massachusetts has until 2020 to reduce its emissions to 25 percent below their 1990 levels: from 94.5 million metric tons down to 70.8 million metric tons. And, so far, so good! In 2013 (the last year for which Massachusetts emissions inventory data are available), state-wide emissions clocked in at 78.0 million metric tons—with most of this reduction having come from the electric sector. That leaves an additional 7.2 million metric tons of annual emission reductions needed by 2020. Luckily, Massachusetts’ existing renewable portfolio standard and energy efficiency plans are some of the best in the country. Expected emission reductions from renewables, electric energy efficiency, and gas energy efficiency between 2014 and 2020 add up to 3.8 million metric tons. But where will the other 3.4 million metric tons of reductions come from? 52 months. Tick tock. Municipal utilities participate in renewable portfolio and energy efficiency standards: Only investor-owned utilities in Massachusetts are required to participate in these programs. Requiring the electric providers supplying each and every customer in the Commonwealth to have the same renewables and efficiency participation would bring an extra 0.6 million metric tons of emission reductions in 2020. Energy efficiency programs reduce electric demand by an extra half of a percentage point each year: Efficiency measures made possible by electric utilities in Massachusetts will reduce electric demand 2.9 percent each year for the next three years. Increasing this goal to 3.4 percent would generate an additional 0.3 million metric tons of reductions in 2020. Gas utilities reduce natural gas use by an extra one-third percentage point: Gas utilities will make efficiency measures available to shave natural gas use by 1.2 percent each year for the next three years. Raising this savings target to 1.5 percent would add an additional 0.1 million metric tons of reductions. But even if Massachusetts got even more out of its existing electric sector emission reduction programs by following these examples, that still leaves a 1.9 million metric ton gap to compliance with the Global Warming Solutions Act in 2020. What additional measures could be put in place quickly to close the gap in emission reductions within the next 52 months? Federal efficiency and vehicle standards? These have the potential to deliver additional emission reductions by 2020, but it’s difficult to estimate just how much they would impact Massachusetts incremental to state programs. There may also be some special challenges for state agencies to demonstrate that these measures meet the very specific requirements of the Kain decision. The Northeast Regional Greenhouse Gas Initiative? 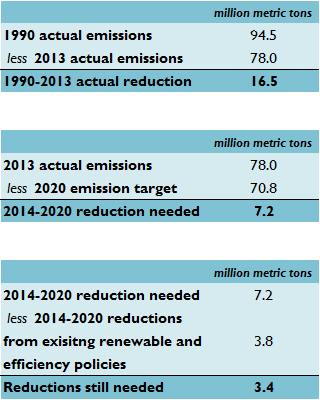 RGGI will bring more emission reductions to the region before 2020, but these reductions are already baked into the numbers presented above. The current RGGI review process may result in lower emissions caps, but these changes are unlikely to take effect by 2020 and don’t meet the Kain standard for emission reduction regulations. Other industrial or transportation emission reductions? Bad news here. Massachusetts industrial and transportation emissions were higher in 2013 than they were in 1990. If this trend continues, other sectors will have to provide even more than the expected 7.2 million metric tons of reductions by 2020 to make up the difference. So far increases in industrial and transportation emissions have been roughly balanced out by shrinking agricultural sector emissions. Time will tell how this plays out in future emission inventories. (3) Other quick turnaround measures from outside of the electric sector. Fifty-two months isn’t a lot of time, and the House and Senate compromise energy bill offers little in the way of concrete measures that will reduce greenhouse gas emissions by the 2020 deadline. Nonetheless, the emission reductions achieved by Massachusetts since the Global Warming Solution Act was enacted in 2008 demonstrate the Commonwealth’s collective ability to roll up its sleeves and get the job done. The Legislature has lost its chance to help bring Massachusetts into compliance with its climate law until 2017, but the Office of Energy and Environmental Affairs’ mandate is clear and there’s no time like the present.